Leafy greens are the mascot for good health. Salads, sautees or smoothies, we should all be eating them in all their varieties to stay healthy. Kale has been getting the most buzz because of its high nutritional content. It’s packed with vitamins such as C, A and B-6, it also contains iron and magnesium. It’s low in calories. With all of its benefits, it’s no wonder that kale is constantly praised for its ability to improve our health. But maybe you’re starting to get tired of kale – or don’t even enjoy the slightly bitter taste – either way, there are many other options in the leafy green family that you should try that provide even more nutrition than kale. You may see watercress as a garnish, but the pungent, yet delicate leaves are starting to pick up in popularity as a superfood. Part of the same family as kale and broccoli, watercress grows in natural spring water and was believed to be a staple of Roman soldier’s diet. You can enjoy two cups of watercress with only consuming seven calories. Better yet, it contains dietary nitrate which can help in circulation as well as blood pressure. It can also provide your daily allowance of vitamin C, E, K, A, potassium, riboflavin and magnesium. Benefits of enjoying watercress include a boost in energy, improved bone health and maintenance of blood sugar levels because of the plant’s antioxidants. Watercress can be blended in smoothies, blanched for a few minutes and added to soups and omelets or, of course, incorporated in a salad or sandwich. The possibilities are many and the benefits are well worth it. Cousins to kale, Swiss chard will exceed your daily requirements of vitamin K and A in just one cup. Swiss chard also contains powerful antioxidants like beta-carotene, lutein, zeaxanthin, and choline – all beneficial for eyesight and overall good health. Similar to watercress, Swiss chard can assist in maintaining healthy blood pressure and glucose in the blood. Further, its vitamin K can assist in bone health. With its bitter, pungent and slightly salty taste, Swiss chard is one versatile green. 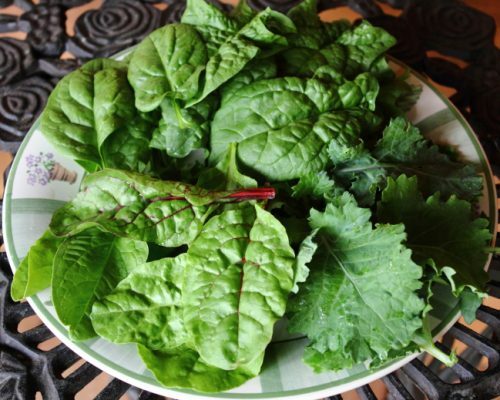 The hearty leaves can hold up well without wilting in salads much in the same way kale does. You may never have thought this common lawn weed was edible let alone nutritious, but many cultures have been enjoying the benefits of dandelions for decades. The beauty of the dandelion isn’t actually in the flower, but rather the leaves. Dandelion leaves provide protein – more than spinach! – vitamins A, C and B, fiber, potassium, iron and magnesium. Dandelions are also high in antioxidants which can fight off free-radical damage. They’re reported to boost your immune system, reduce inflammation, maintain healthy blood pressure, and improve liver function by removing toxins. With all these benefits you’ll never look at this lawn-weed the same way. Given its rise in foodie circles, you’ll start seeing it more commonly in stores. Even the kind you pick from your back yard is safe as long as pesticides have not been sprayed. Parsley is often hidden in dishes to add flavor, so sadly it never appears as the star of the plate. But no matter how you use it, your health will benefit. Parsley is low in calories, fat and sugar but packed with vitamins K, C and A. Parsley is also high in chlorophyll and research has shown that chlorophyll is effective in blocking carcinogenic effects of heterocyclic aminos – this happens when you’re grilling and the food becomes charred. For safe grilling, enjoy a leafy green salad with parsley on the side. Parsley can be added to any meal to brighten the flavor. Even though it doesn’t need to take the lead, it’s still working hard to keep you healthy. If you’re getting bored with kale but still want the benefits, swapping in these other leafy greens are great ways to maintain proper health. Really, though, any leafy green will be good for your health and the darker the better. Be creative with your leafy greens. Having a salad every day can get quite boring and you may not want to eat them anymore. By incorporating greens into all meals in some form – sautéed, boiled – you can enjoy health benefits in a variety of ways. Key lime pie and margaritas! If that’s all lime was used for it would still be invaluable. But this zesty tropical fruit is consumed throughout the world in the form of beverages, refreshing cocktails, pickles, jams, snacks, and in cooking. Do you keep apple cider vinegar in your kitchen cupboard? If not, maybe you should. That’s because the health benefits of apple cider vinegar are wide-ranging – rivaling those of other natural helpers like tea tree oil and garlic.